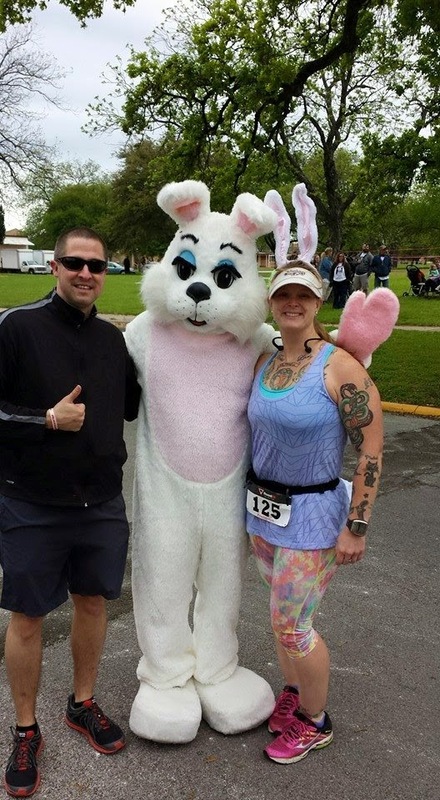 The day before Easter was my very first Easter themed run!!! 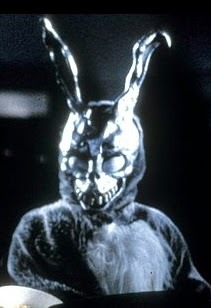 I, of course, had to dress the part. 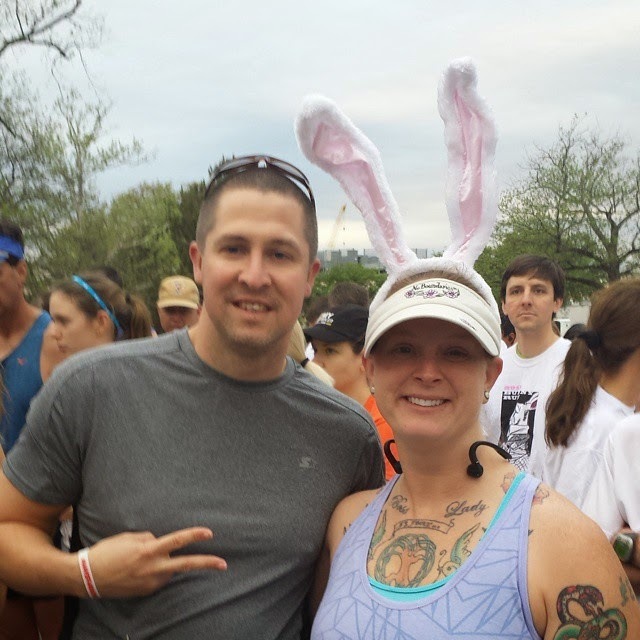 So, I went and got me some bunny ears (that were at least somewhat reminiscent of Frank from Donnie Darko’s bunny suit ears). 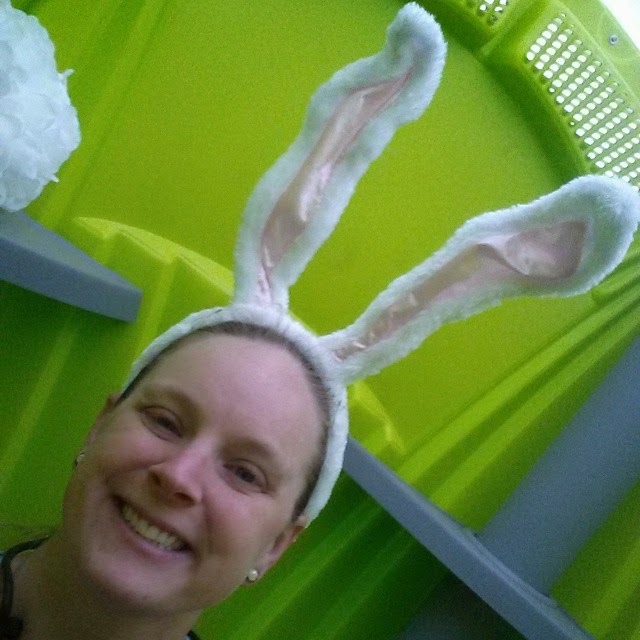 And, after much searching, finally found the perfect item to make a large bunny tail for myself: one of those faux flower balls in the wedding section. I had originally thought to use a shower pouf, but decided that would be too small. Then, as I was wandering around various craft sections in various stores, I saw a large Styrofoam ball. I could glue cotton balls to that! But then the issue of how would I affix it to my behind without it falling off arose, so I nixed that idea as well. I went to Michael’s and was just wandering around, seeing what they had, when I found myself in the wedding section. You know how some brides, instead of carrying a bouquet, prefer to have a ball of flowers that hangs from their wrist on a ribbon? Well, they had some of those! They were white (YAY) and round (YAY) and absolutely perfect for being purposed as a bunny tail! 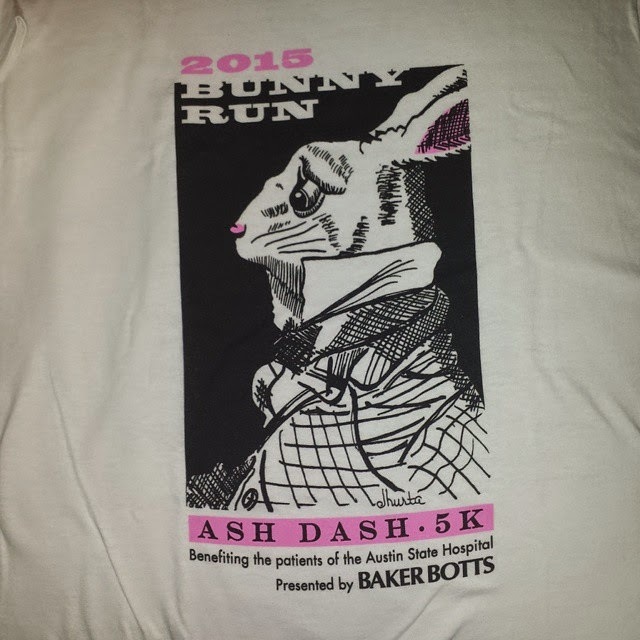 This run is put on and hosted by the Austin State Hospital in Austin, TX (hence the ASH in ASH Dash). It is also run completely on the ASH grounds, so no need to hire a barricade company or police officers to stand at intersections. Because of this, you would assume it would be a relatively cheap race. Not so. It was $35 for regular registration. $40 on race day. This is the top of what I am willing to spend on a 5K that does not offer bling or otherwise amazing swag. I do have to say that I absolutely love the shirt. I love how the bunny brings to mind the rabbit from the Mad Hatter’s tea party in Alice In Wonderland…just without the look of sheer anxiety. I seriously wish this shirt was a tech shirt so I could wear it all the time while running. But, it will get it’s fair shake as a gym shirt and regular everyday wear shirt. Morning of the race, I stopped by Starbucks for an iced coffee (sans ice…more coffee!!!) and then to Einstein Bros where I grabbed me a chocolate chip bagel. Normally, for a 5K, I’m not going to eat anything pre-race. However, this was different. I was purposely setting out to try for a PR at this race. It’s basically a completely flat course. I want to offer a disclaimer about how I’m doing my PR calculations. A lot of people base their PR times on their official chip times (I do this for 10Ks, 10 milers, half marathons and marathons), but for 5Ks, I try and base it on when I actually crossed the 3.1 mile mark. So, my PR going into this race was from the Stand Up 5K last year. The time to beat was 28:18 minutes (official chip time for that race was 28:56, I believe). It was a small field at the start line and I was up front with the fasties. They started us and I shot off. As we neared the half mile mark (which, with the loop-arounds we would be doing, was also the 1 mile mark), my pace was sub-8 minutes and I was just hoping and praying that I wasn’t going to burn out, so I let off the gas a little bit. 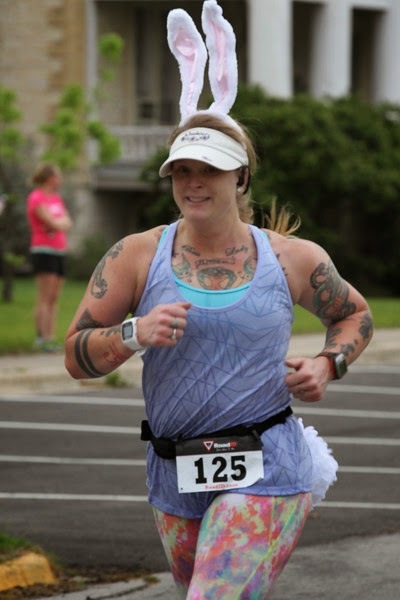 It was a bit windy out and I kept having to hold my bunny ears so they didn’t fly off my head, so I know that affected my running economy a little bit. Miles 1 and 2 were both sub-9 minutes. Mile 3 was just barely over 9 minutes. The course, according to my Garmin, was 3.2 miles. I crossed the 3.1 mile mark at 27:32 minutes. BOOM! PR! By 46 seconds, so a pretty good one, too! My chip time was around 28:24 minutes. So, either way you slice it (whether you determine your PR based on chip times or when you cross the distance mark), I had a PR. I was so happy! 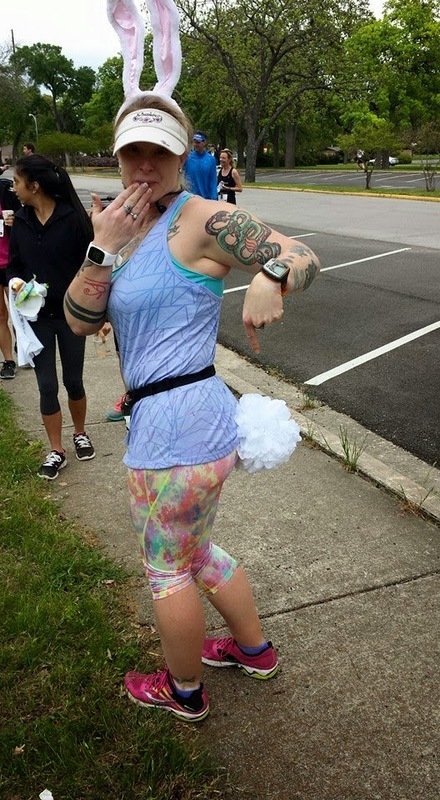 While running, I paid attention to the other ladies that were running to see what my competition in my age group might be like. I thought I had a chance, but either the ladies in my age group look older or younger than they actually are, because I placed 7th in my age group. My friend, Rob, who runs pretty fast got a cramp early on that messed up his time and as a result he placed 4th in his age group. So we both lost out. We also didn’t hang around for the awards ceremony since we found out we didn’t place in the top 3 of our respective age groups. 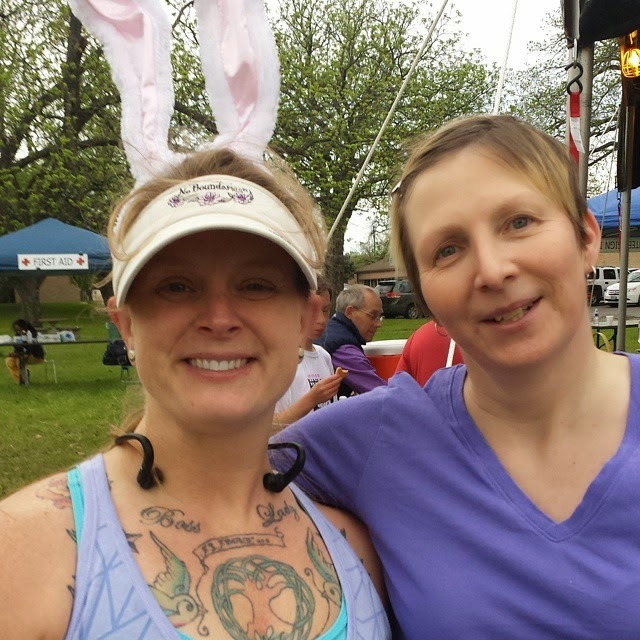 They were handing out bunny shaped trophies for the top 3 finishers in each age group. Overall, I was VERY happy with this run and I’m looking forward to doing it again next year. oh my! look at those fluffy buns! And here's a my 2 favorite official race photos...hooray free downloadable race photos!!! 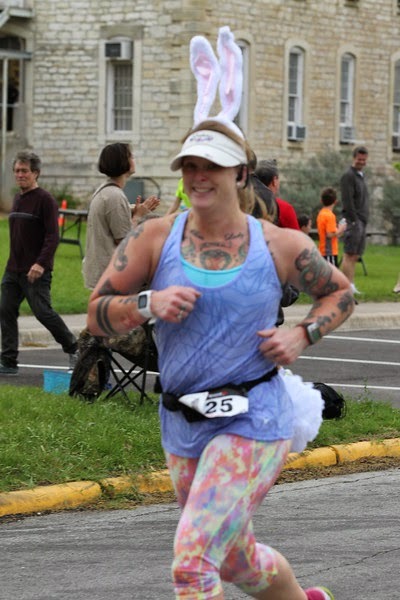 I love that my bunny tail shows up in these photos!